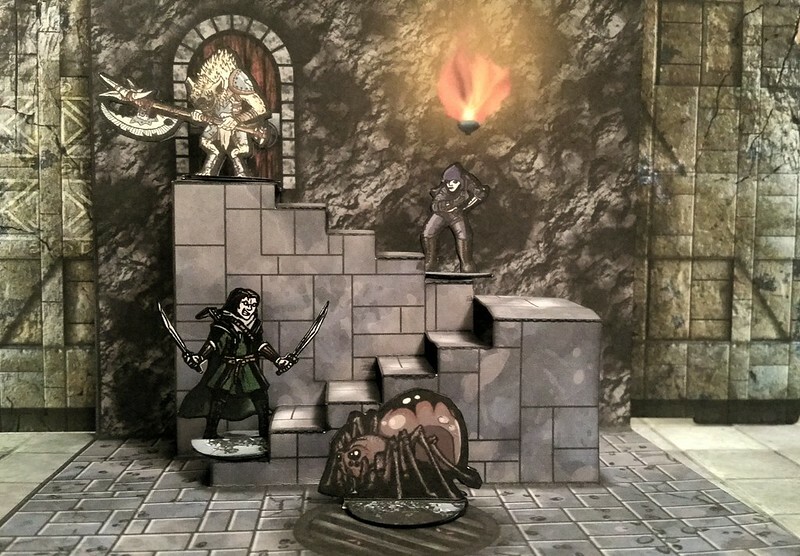 This is related to the OldSchoolDM's Paper Terrain: Designer Staircase Sampler project, described in detail in this thread. This thread will be home to all the resources related to this project. 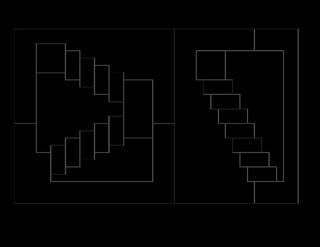 Also, any insights, questions and discussions about how to prepare a submission for using OldSchoolDM's staircase templates. This post will be regularly updated as more tools an tips emerge. 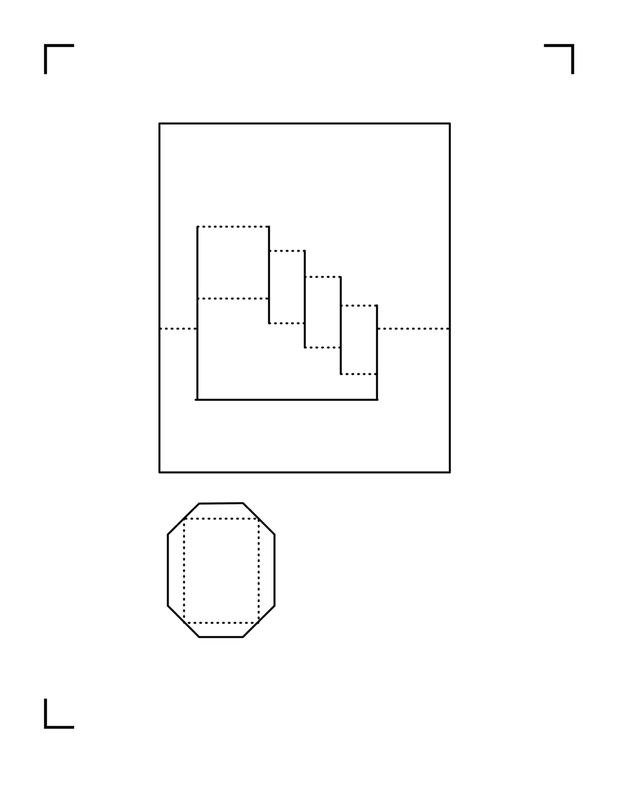 I'm out of town at the moment and hesitant to upload only the .studio and .pdf files for a subset of the geometry I'd like to see in the kit. When I get back next week, I'm planning on creating PSD files with element-layers and clipping-masks to make the conversion process as easy as possible (something I want to do so as many designers can contribute as possible.) If you're eager to start before then, let me know and I'll go ahead and upload what I've got, but no rush on my end. - Add your logo and contact information to the same single layer. - Private: Send is as a PM attachment (or pointer to a web-accessable document) to OldSchoolDM on Cardboard Warriors, labeled "Contribution for Staircase Sampler"
- Include any specific language you want in the READ.ME - usually this is the copyright notice, etc. 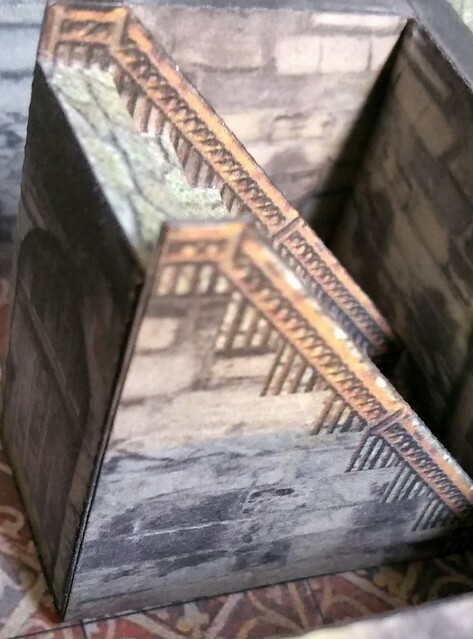 Popup terrain is different from other paper terrain. 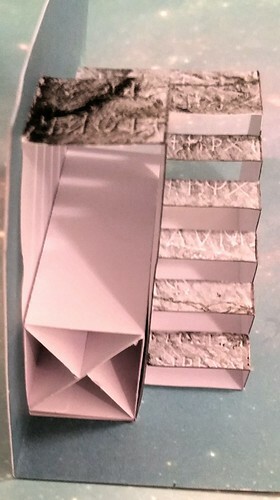 These models all are made from a single sheet of paper, so there are giant "holes" in the model when it is unfolded for play. 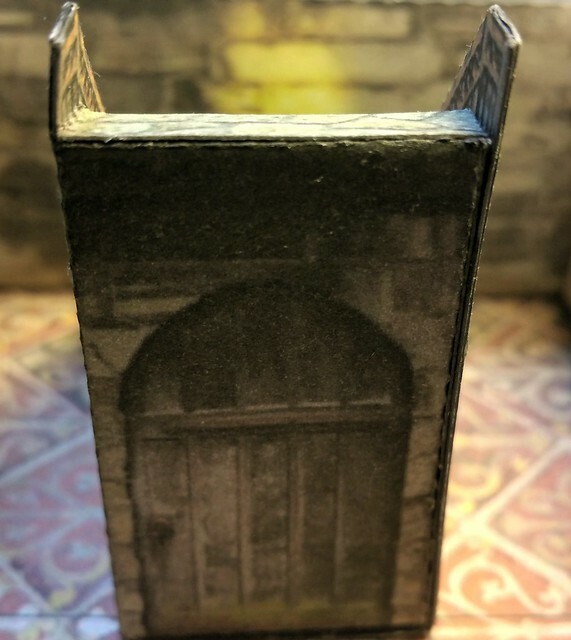 I've worked out an interesting "second sheet" approach, which still allow the model to fold-flat, but replaces the pop-out segments with a backdrop texture made of the floor and wall textures. By submitting your work either by PM or public posting, you grant me a royalty-free, non-exclusive, and unlimited license to use the submitted textures in this kit and future other collections. You retain the full rights to your submission otherwise, and may republish it in any way you wish. 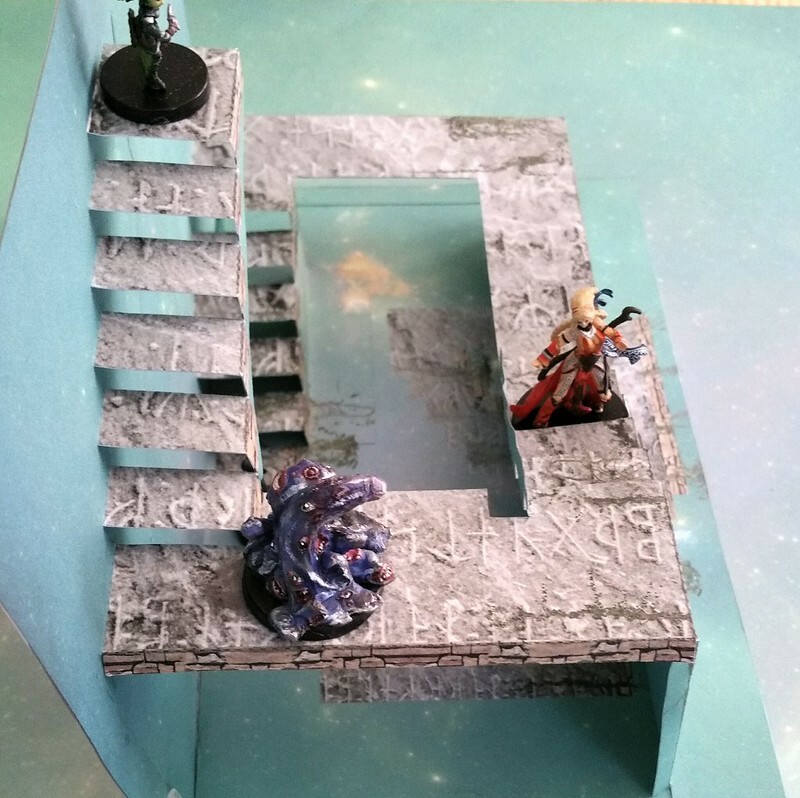 afet proposed a design mod over on the FDG Forums of using a fold-down flap to strengthen the platforms. I'm excited to try that ASAP, especially since at least one designer is already playing with textures for one of the models. My problem is - I'm on vacation in Austin, and not near a printer, cardstock, a knife, or a cutter until next Wednesday. So, I'd like to ask one of you to cut this. If you have a cutter, you don't even need to print it. In that case, just turn off the regmarks and cut on blank cardstock. So it should go quick. 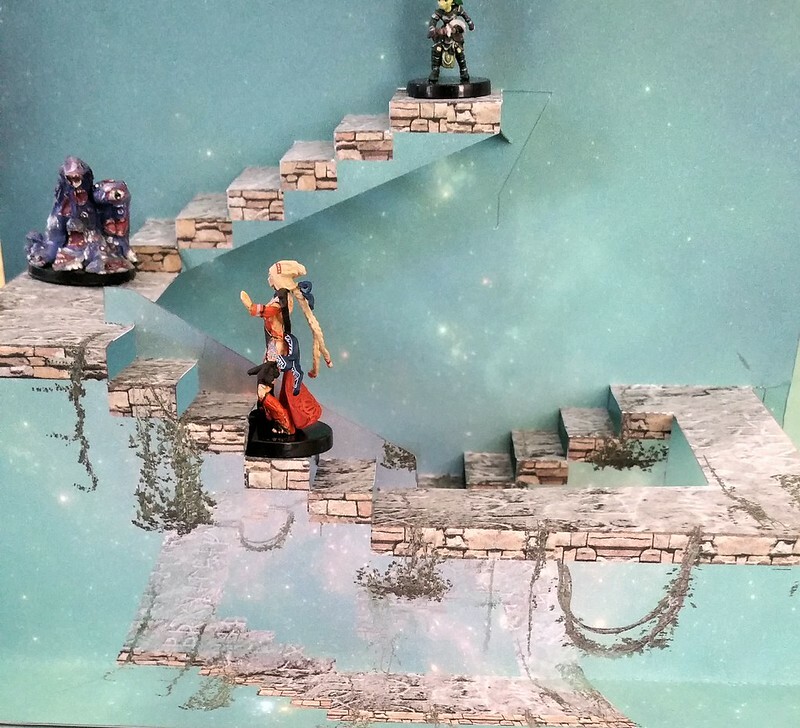 One possible downside of this mod is that the "hole" in the back wall and floor will now be obviously wider than the platform surface, so this would probably require the Backdrop Page construction option. That's why I chose this model to test with, as it's already one that really wants a backdrop page anyway. If you test this, please share your results first without the backdrop page, then glue a blank backdrop page behind the model (just fold the model and glue a folded sheet around it, retaining its popup properties. The let me know how that version works out. That's the one I think will really work well with afet's mod. If you can, post photos along with your comments. For the second clarification, lets look at my build of the FDG side. 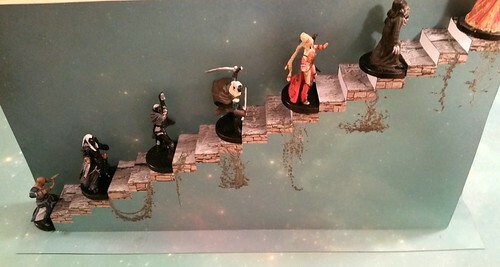 Notice the odd fold-down flap at the top of the stairs - that is a kitbash (build variant) of this kitbash. As such, it is a bad example for a sample texture. 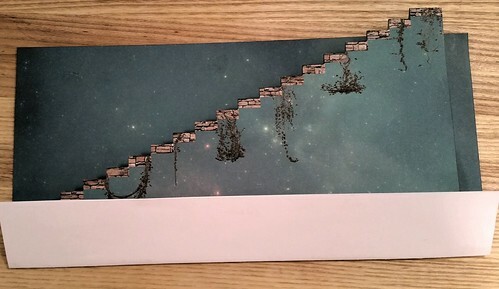 Feel free to texture properly to the top of the page, just like all the other staircase texture examples. What this is a good example of is how far I'm happy to have you take your texture designs in the kitbash direction. See what you can do with such a simple base design by adding two fold lines? Your texture designs do NOT have to include beams! You can make that space solid. Or, create new cutouts. I'll happily add your pattern to the file as a selectble set of cutlines. 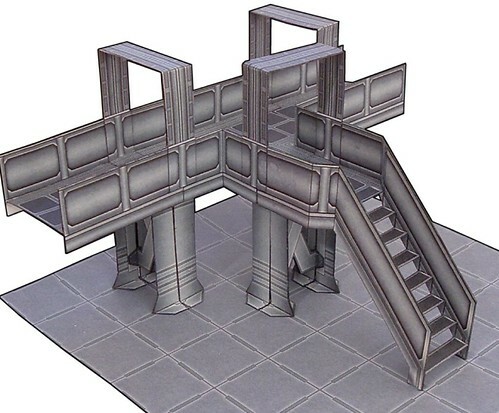 I really hope someone makes a modern/future set of girder work texture for this model in particular. Let's collaborate on making these as awesome as your imagination can take them. 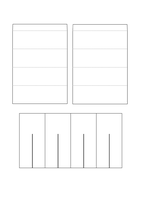 The fold-down flaps shown on the far left and right should work. However, if you were to make the flaps separate and include them with the background filler file, they could be cut out and added to both sides of the landings. they would still fold up and allow the model to fold flat. for the small, uppermost landing a similar seperate fold down flap could include a triangular brace going down to the wall. The Fold-down for the top doubling as a back-brace is, again, pure genius! I went ahead and changed the earlier post's files to reflect this idea. Ok oldschooldm, after working on this all day, I have it done and you will be quite surprised as to what I made. Im not going to show it yet as I am going to make some minis and a prop to go with it. As you wouldn't appreciate it until you see the whole set together. Hopefully in the next day or to Ill send it over. I did send it through the cutter and it looks good. A few minor things I have to fix. Ok oldschooldm, after working on this :Pall day, I have it done and you will be quite surprised as to what I made. As suspected, the mod offers a LOT of strength to the platforms. 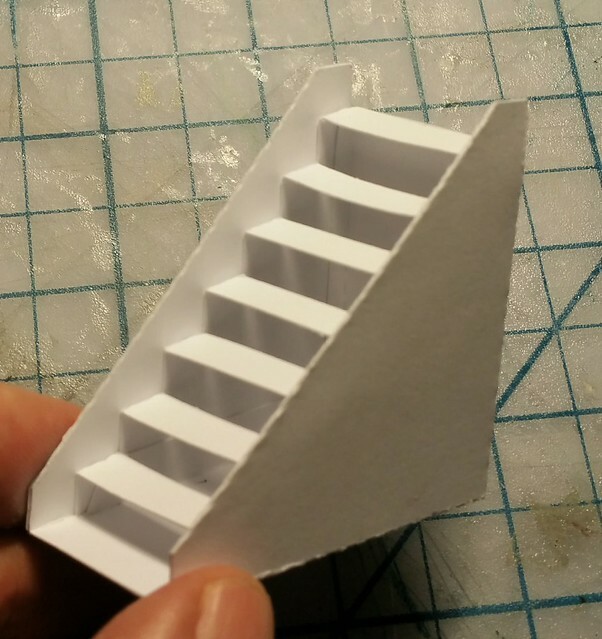 This is two sheets of paper, no glued in supports - the only glue used is attaching the solid back sheet. 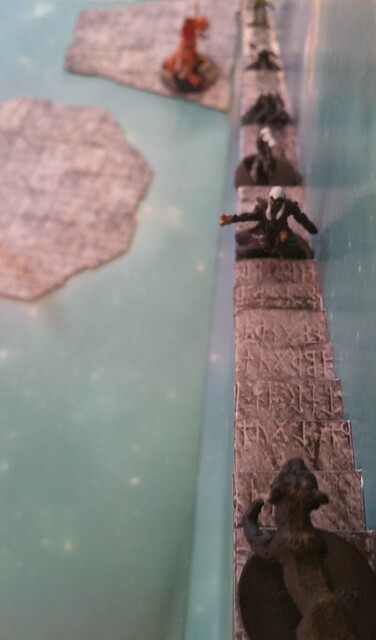 Those are old-school metal minis. When positioned near Afet's Fold-Down mod, it's quite solid. Not so much for the interior side of the platforms. 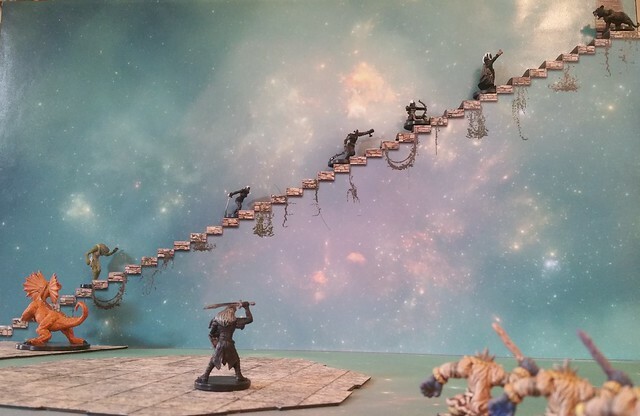 With plastic minis, this is more than enough strength. I pronounce the mod a success, at least when using a background sheet - this model "Hollow Spiral" and "Quad Landing" are going to require a backdrop sheet I think. The others seem to be fine without. 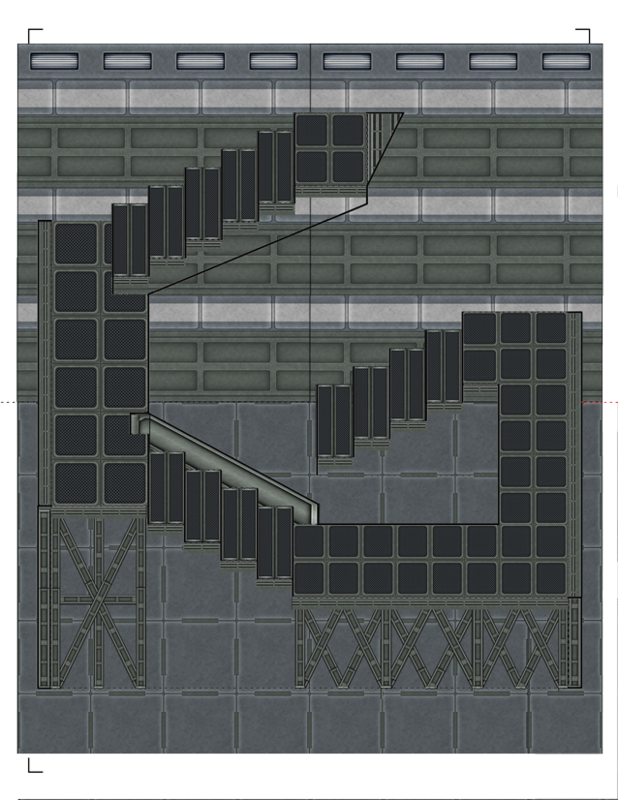 In short, I think everyone should submit two textures: The first: floor and wall alone (for the sometimes-optional backdrop sheet) the other texture being the staircase details. Whoa! 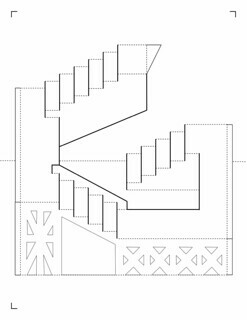 If we do that, builders can mix-and-match floors/walls with staircase designs. Hmmm. Is that too much? What do you think? Hopefully these will help clarify what textures are being worked on, and by whom. :-) Red means something that needs doing, orange means we're getting started, yellow means we are in process, and green means ready (or plenty). There are two tabs at the bottom of the page to access the two sheets shown. Everything you need should be there (latest PDF, Studio, etc.) and if it isn't - let me know and I'll get it right up. 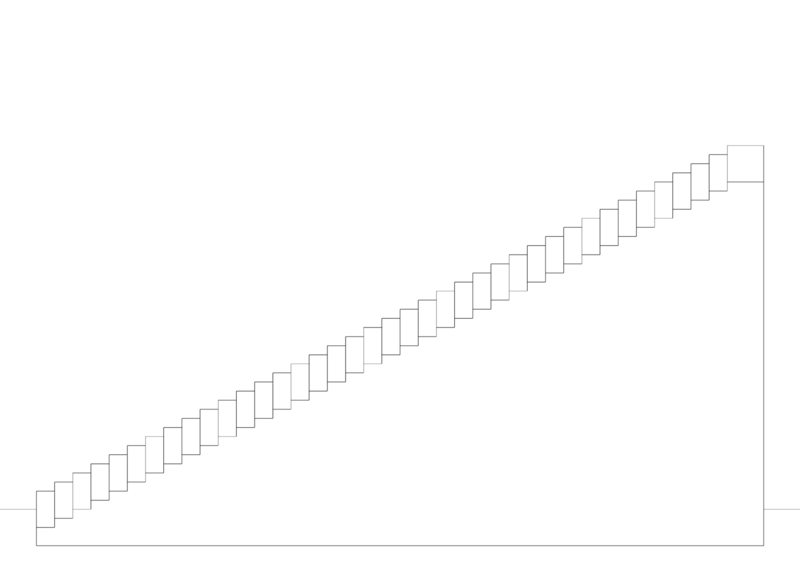 Right now, we could sure use some for folks wanting to texture the staircases with multiple landings. Keep in mind that, if you create a texture for one of those it will be more prominently featured in promotion photos since it's complexity makes it more attractive/interesting. 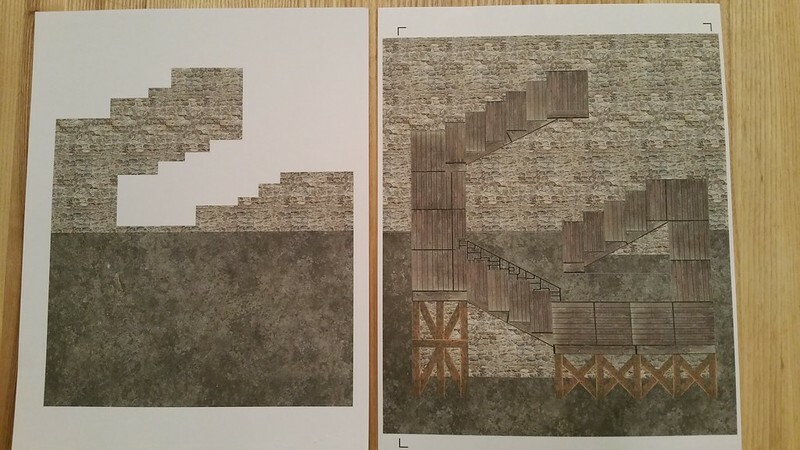 Also - what do you think about submitting two layers: one with just the floor and wall, and the other with the staircase details over it? Lots of flexibility for customers (and required for two of the more detailed designs, but I don't know if would limit your creativity - which is NOT what I would like to see. I suppose leaving them white and calling it Escher House of Stairs wouldn't work, but that's about all I would be able to manage at this time. If no one submits a texture for this, it's OK - it's such a special case - I just won't include it in the kit. It will just stay in the thread here. On the other hand - I could design a slightly smaller one 11x17 for example. Let me know what you think. 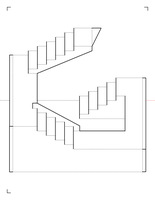 I've updated the Hollow Spiral staircase model to account for some reported problems. 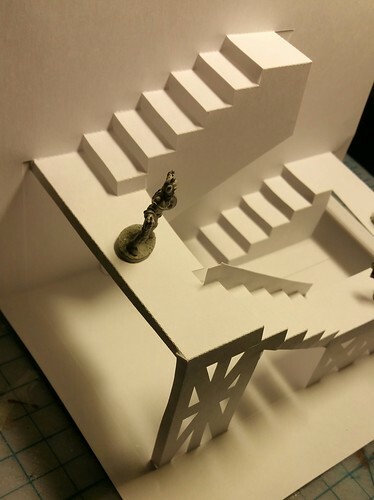 I reduced the amount of "floating" paper on the back staircase front to be the same as in the prototype I build, and I properly aligned the floor/wall fold line, which got out of whack at some point. The links/attachments back on the original post have been updated. 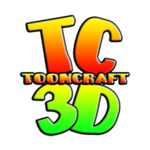 I also added a PNG version of the model as an attachment here, to avoid scaling issues some people are having. If you compare the two images, it becomes clear that I've got a few problems. 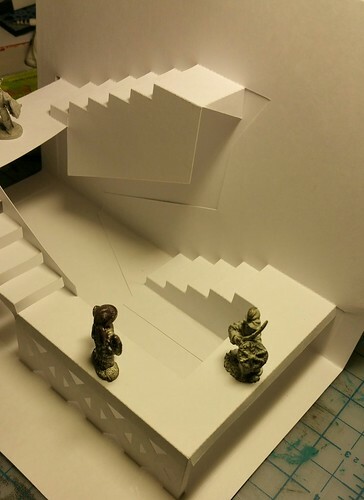 First - since I don't have sides on the catwalks, most of the metal-texture is floors/treads, which are all DARK. Also, the textures have no "weathering" or shadows - so Christopher Roe's wonderful textures end up looking like - well, like I pasted them in. So the whole model seems way too dark, and too sanitary. And I'm clueless about what to do about either problem. I don't even want to waste the ink to print and cut this. I have NO artist skills whatsoever and feel I'm doing a disservice to the contribution. So - a favor - could one of you take this over the finish line for me? It's a Photoshop file with all the major elements as layers. If you're going to help on this, please leave a note on this thread so that two or more of you don't pick it up at the same time. 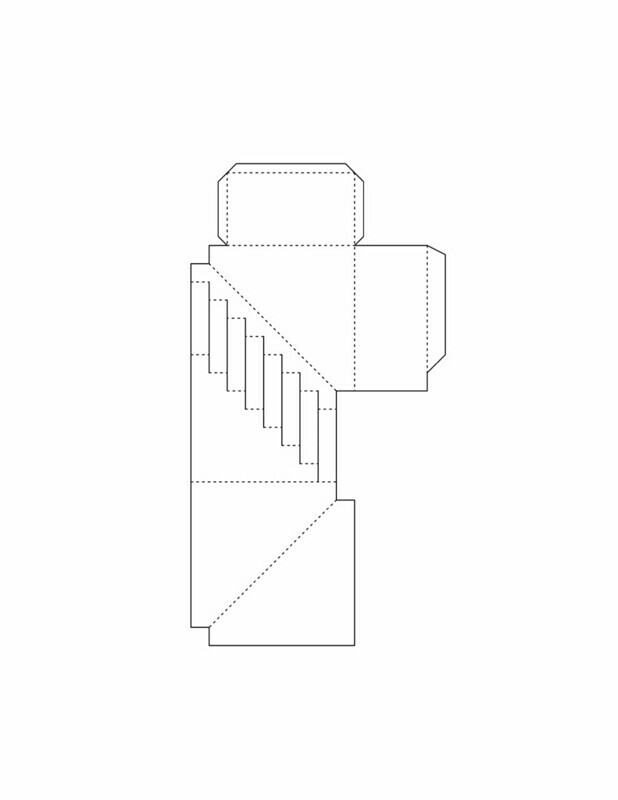 The minimum submission is a single bitmap file containing all the details of your stairs floor and wall, properly aligned to the reference staircase model. 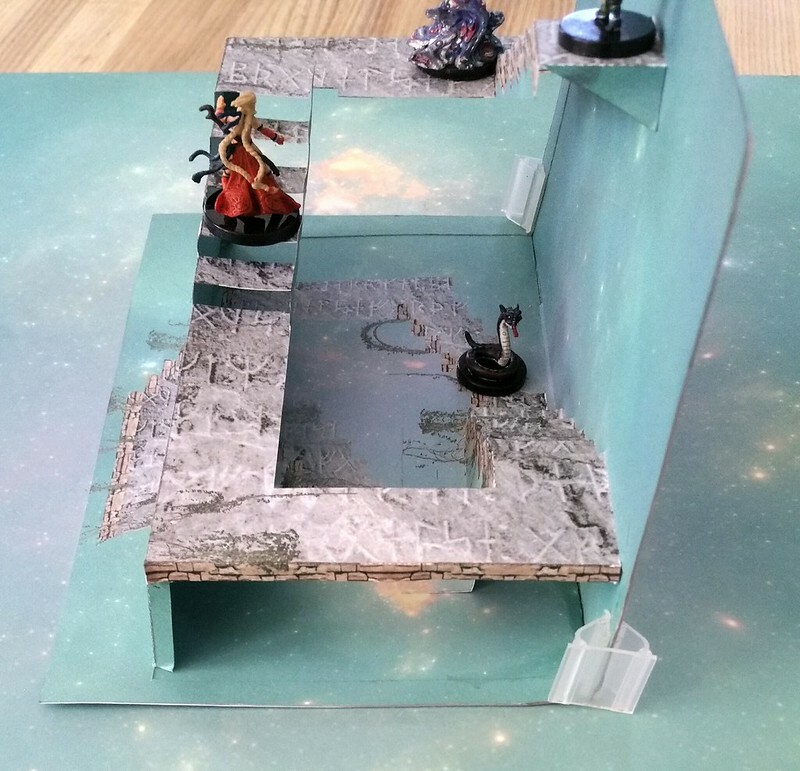 If you're working on one of the models that requires a visible backing sheet, such as "Quad Landing" or especially "Hollow Spiral" then a separate image (or layer if you sumbit a PDF/PSD) with just the full floor and walls is required as well, to "fill in" the holes. If you choose to submit any model with a separate layer for the staircase (treads, supports and platforms) and also the wall/floor, I'll be happy to offer them as separate layers in the product PDF, but this is *not* required. In fact, it seems like the really rich shadowing effects on some of the models already submitted mean that splitting this into separate layers might be a waste of time & effort, so be warned that if it doesn't look good in the kit, I won't use it. 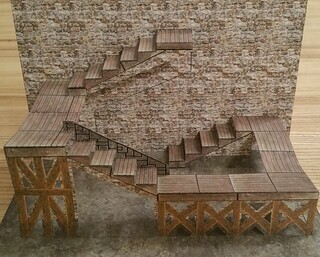 I took my Infinite Staircase textures and applied them to the other models. 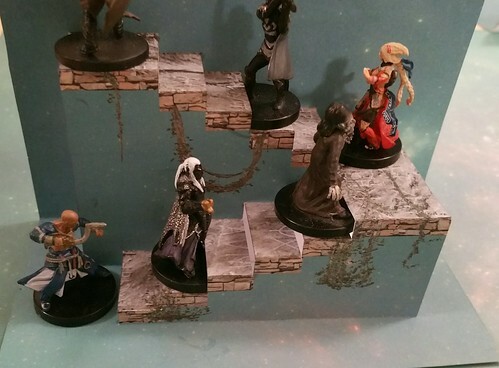 For now I'll just show you what I did with the Hollow Staircase... The rest will show up in live play photos soon, since we're playing tomorrow! 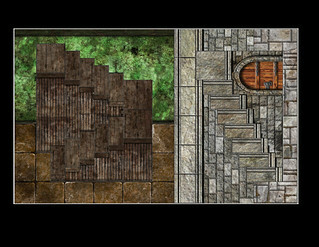 I'm not 100% happy with the interior image (it needs skewing in several places) - this is what I'm going with for tomorrow's session. It's pretty great anyway. Session got cancelled. :-( No matter - I'll share some of the latest innovations with you all anyway. I've got an easy fold-flat method for keeping many of the models open in perfect position - a 1x1in removable brace. Doesn't work on the Hollow Spiral. Could be shortened to work, though. Update: Source files moved to dropbox. The spreadsheet and this thread have been updated with links to the new home of the files. They have not changed since 2/27. 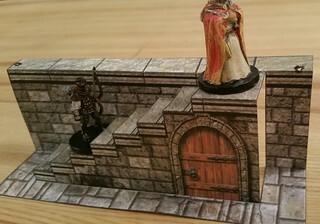 This allows non-cardboard-warriors to contribute to the project. More designers! Yay! As a bonus, this returns some archive space to the board. NEWS! We have another submision - this time from Brave Adventures. See the Archive thread for more pictures - but this submission comes with a BONUS! Several other designers textures are in process! Hope to share them with you soon. Thanks again, so very much Brave Adventures for participating in this project. 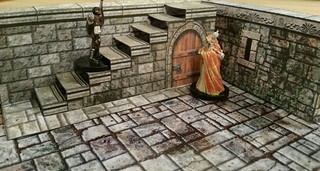 Your staircase was so inspirational I added a new model to the kit! Woot! 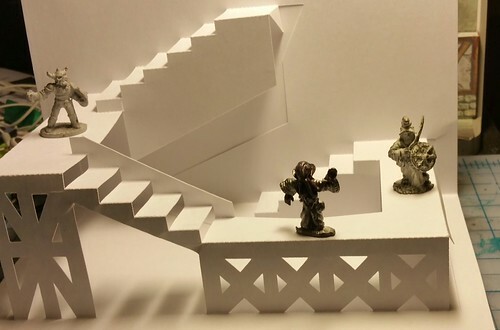 Another new design: "Tiny Stairs". Designed by BilliamBabble Inked Adventures to be both part of this project and compatible with his latest project. 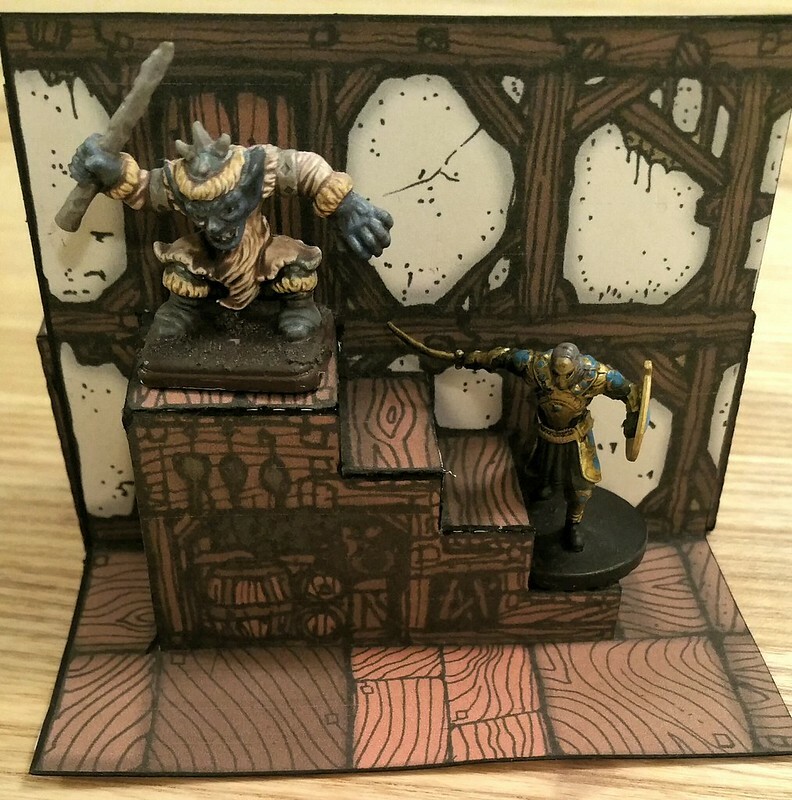 See cardboard-warriors.proboards.com/post/68254 for details. Thanks again BilliamBabble Inked Adventures! 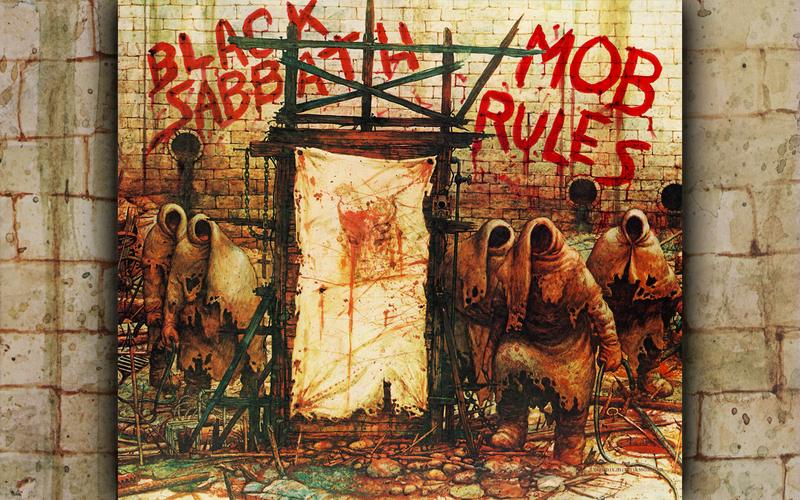 oldschooldm.. I haven't forgotten about my submission.. 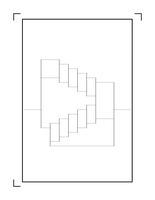 I think when I get the stairs sets done for my harbor/wharves project is I'll take a look at the alignment issues you pointed out to me and get them corrected. - You started a couple of really cool ideas, but we got stuck at the walls? - I can't wait to see what you'd make! - At least one of these templates has to work with your Kickstarter stuff, and I'm not opposed to adding more versions - check out Billiam's stuff! - You were one of the first to get started, but we stalled for some reason. Probably my fault - can we bring that cool cyberpunk staircase home? - You're the one who introduced me to the joy of interior kitbashing, so something from you would be special. What is making this project so amazing is the range of styles going into it. Honestly, I know it has stretched my horizons working with your designs and related kits for this project. More Staircases! They Are Awesome! Sorry, getting back on it. Thanks for the ping! School marking has been unusually difficult and time consuming this semester. There is a new design! You can read more about it here. The tracking spreadsheet has been updated with this as an option.